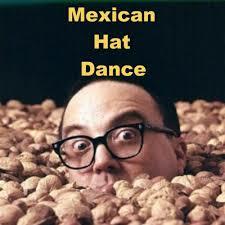 SILLY SONGS and SATIRE: Apocryphal Ballad: Larvae Sing "CLOTHING MOTH HAT-DANCE"
Apocryphal Ballad: Larvae Sing "CLOTHING MOTH HAT-DANCE"
ORIGINAL SONG: "Mexican Hat Dance" (spoof) Allan Sherman, 1963. The original music, based on traditional Mexican dance-forms from the central and southern part of the country, is also known as "Jarabe Tapatío"; the music, unaccompanied by lyrics, is a typical repertoire item for mariachi. LIMERICK VERSE: Two original poems composed by Giorgio Coniglio, 2017-2018, provided the fodder for these song lyrics. The verses have now been finalized and published at the OEDILF website (the Omnificent English Dictionary in Limerick Form). They can be found more readily on the post "Limericks about Clothing Moths" on our sister blog "Edifying Nonsense". PARODY COMPOSED: Giorgio Coniglio, August 2018. SONGLINK: The melody and lyrical adaptation for Mexican Hat Dance were used previously by G.C. as the base song for "Dante's 'Inferno' Canto#5a: MINOS'S TAIL TWIST". We eat sweaters and shirts, even hats. Like your suits; we don't fancy things wetter. Like that guy who wears Mexican hats. Olé! We can't stand foam or froth. Our favorite food's 'whole cloth'. Are a family meal for the moth. As adults we don't need feed our offspring. We just mate, and do things of that ilk. Ravage cotton and woollens and silk. Clothing moths! Live like toffs. While your old sombreros we doff. We'll infest your old box of 'linguini'. But don't like your rendition of 'sauce'. The scraps literally filled up our platters. We're engorged on keratinous matter. Left large holes in chapeaux made of cloth. That's the work of the quirky clothes moth. Olé!